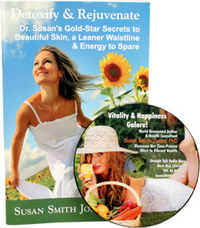 Detoxify & Rejuvenate: Dr. Susan's Gold-Star Secrets to Rid the Body of Toxins & Glow with Vibrant Health by Susan Smith Jones, Ph.D. Plus Bonus CD - Penn Herb Co. Ltd. Within the past 50 years our world has been introduced to - synthetic chemicals, air and water pollutants, heavy metals, prescription drugs - and it's more than our natural detoxification systems were designed to handle. Discover common herbs, foods and simple lifestyle changes to help you fully detoxify so you can look and feel your best! FREE CD - VITALITY & HAPPINESS GALORE: Dr. Susan discusses her time-proven ways to vibrant health and helps you create your healthiest life ever. You will marvel at all of the practical tips on detoxifying the body and living a balanced life.